*DMTs included in the clinical trials: interferons, glatiramer acetate, or natalizumab. 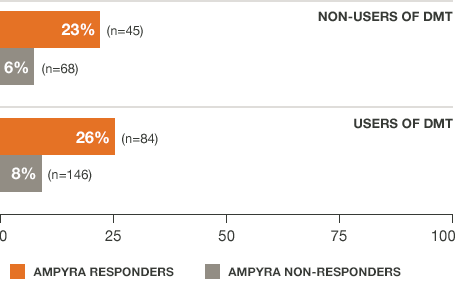 Not every patient responds to AMPYRA. Individual patient response to the therapy may vary. A responder was defined as a patient whose walking speed on the Timed 25-Foot Walk (T25FW) was faster for at least 3 of 4 visits during treatment than the fastest speed measured during 5 off-drug visits. 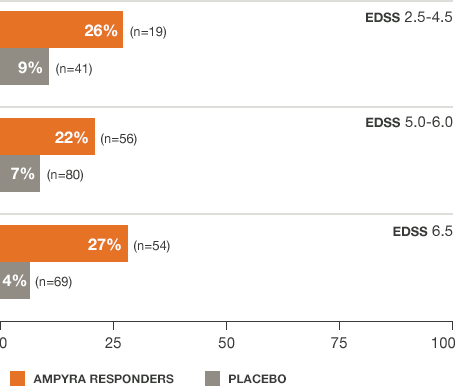 AMPYRA® (dalfampridine) was evaluated in 2 randomized, placebo-controlled studies including a total of 540 patients with disease durations ranging from 0.1-45.6 years (mean of 13) and Kurtzke Expanded Disability Status Scale (EDSS) scores ranging from 1.5-7.0 (mean of 6). Inclusion required a baseline Timed 25-Foot Walk (T25FW) between 8 and 45 seconds. Exclusion criteria included a history of seizures, EEG evidence of epileptiform activity, or an MS exacerbation within the past 60 days. Study 2 also excluded patients with severe renal impairment. 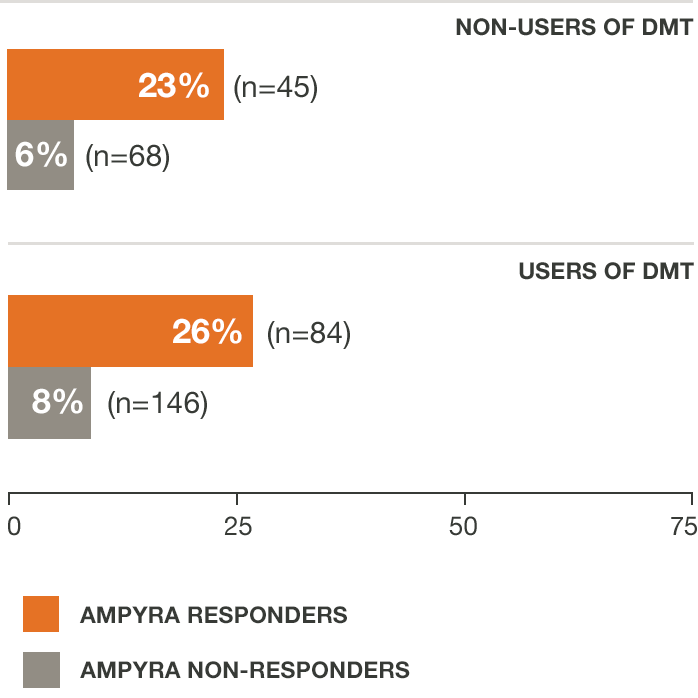 Study 1 was a 21-week study with 14 weeks of double-blind treatment with AMPYRA 10 mg twice daily (n=229) or placebo (n=72). A total of 283 patients completed all study visits (212 AMPYRA and 71 placebo). 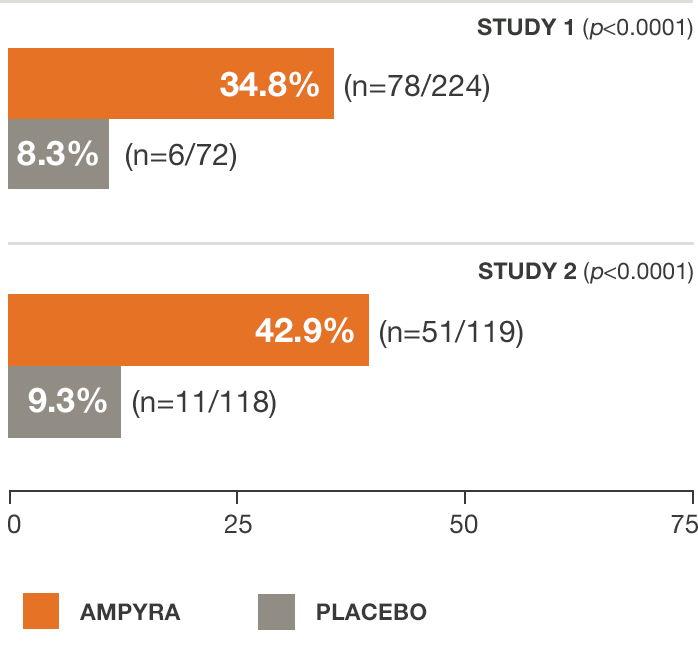 Study 2 was a 14-week study with 9 weeks of double-blind treatment with AMPYRA 10 mg twice daily (n=120) or placebo (n=119). 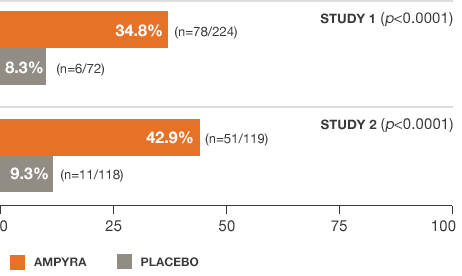 A total of 227 patients completed all study visits (113 AMPYRA and 114 placebo). *Pooled data from studies 1 and 2. Individual patient response to therapy may vary. 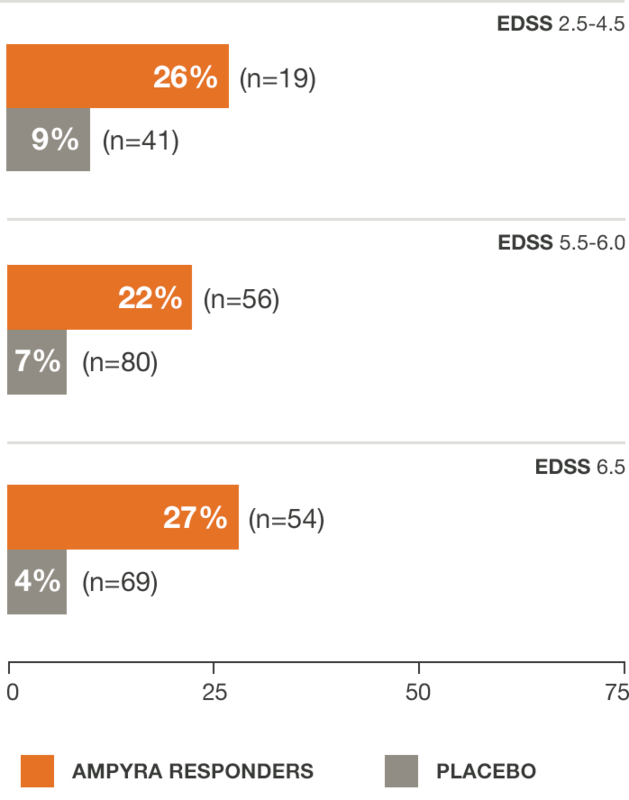 For AMPYRA non-responders, average % change from baseline walking speed was 11.7, 8.2, and 3.2 for EDSS scores of 2.5-4.5 (n=37), 5.0-6.0 (n=99), and 6.5 (n=78), respectively. *AMPYRA was effective in improving walking when used with DMTs interferons, glatiramer acetate, naralizumab, or when used alone. †Pooled data from studies 1 and 2.